Italian extreme fantasy metallers Thulnar from Bologna have finally released their long-awaited new work. It is the debut EP “Nightfall in Theros“, which is actually their first “official” work, 11 years after the band’s foundation back in 2004. Thulnar is practically the personal project of Darken (Diego Vacchiano), who composes and plays all music. He always had the help of his friend Luca Piazzi aka “Elric Blackcrow”, who takes over the vocals (Luca also plays trumpet in Mors Tua). The idea behind the band was to combine classical orchestral symphonic music with the aggressive sound of metal. They released 2 demos, “Thulnar” in 2004 and “The End of the Blissful Days” in 2007. 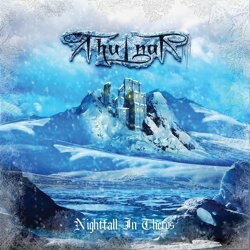 Soon after the band started working on its first full-length album “Talaborn Skies“, but before its completion they decided to release the 3-track EP “Nightfall in Theros” on January 13 2015, as an appetizer to the upcoming album. Those who have listened to the early works of the band, will immediately recognize the huge improvement in sound quality. While their demo albums were closer to epic fantasy black metal, they now label their music extreme fantasy metal, something which is much more accurate, since apart from some vocals, their sound is far form the typical black metal. With orchestrations closer to epic power and symphonic heavy metal and a wide variety of vocals, “Nightfall in Theros” includes 3 amazing tracks of the genre, with a total duration of almost 16 minutes. Guitars are more dominant than ever in their sound, with wonderful technical leads and excellent solos, followed by epic symphonic synths. Influences of classical orchestral music are more than evident, both in the music and the vocals. The band had already proven its skills on melodic synth-based music and now it’s time for them to focus on guitars and vocals. Darken’s guitars have a great quality, especially in lead guitars, where he has found a perfect balance between technical “virtuosic” and melodic playing. Except for the lead black metal vocals by Elric Blackcrow, their songs are full of epic clean vocals and choirs, performed by many guest singers, both male and female, something that helps the band built a much stronger fantasy atmosphere. The opening track “Wise Men of Hope” has a more aggressive bombastic mood and is my favorite of the album, while the second one “Nightfall in Theros” moves in slower atmospheric paths. The last one “City of the Golden Halls” is moving somewhere in-between, focusing more on the epic choral vocals. Despite the short duration of the EP, Thulnar manage to present a quite versatile work, having at the same time a solid epic atmosphere. All of their lyrics are in English, based on a fantasy concept written by the band. Summing up, Thulnar released a very promising EP with 3 killer songs and their next “goal” should be to keep the same level, diversity and interest in a full-length album. This symphonic genre, full of rich orchestrations, choirs and different vocal types demands perfection and in my opinion the band has still a lot of work to do, especially in the vocals. The truth is that they have already worked hard to produce a much better sound quality, but there is always room for improvement. The good thing is that their compositions are very good, both catchy and technical. They also seem to do things slowly, without rush, so I am sure they can present something even better in the future. Nonetheless “Nightfall in Theros” is a great EP that can be enjoyed by a wide range of fans, being it sympho black or symphonic power metal fans, or non-metal fans at all who just like to listen to epic melodic symphonic fantasy music. The EP is available in many digital stores and it is also self-released in standard jewel-case pro CD-R with 4-page booklet, including all the lyrics. The CD is manufactured on demand when ordered and it can be purchased via Amazon.com here. BOTANIST to release Euro Tour EP!